The initial evidence that synaptic changes could play a central role in depression came from looking at the effects of stress on synaptogenesis. Over the last 15 years there have been more than a 100 articles documenting the role of stress in causing atrophy and a reduction in branch points in CA3 pyramidal neurons in the hippocampus49,50. Watanabe et al.51 demonstrated atrophy of apical dendrites in the CA3 cells following chronic restraint stress. Impairments of long-term potentiation (LTP) were induced in the hippocampus and the amygdala-prefrontal cortex pathway by acute and chronic stress52-54. In parallel, differential expression of genes associated with synaptic functions was documented after stress exposure55-57. Stewart and colleagues58 have recently shown that synaptic plasticity while reduced by stress is increased by learning tasks. In a similar experimental design, Sandi and co-workers showed a rapid reversal of stress induced loss of synapses in CA3 of rat hippocampus following water maze training59. This body of literature suggests that synaptic plasticity is a rapid mechanism involved in response to both negative and positive stimuli. The mechanism of such remodeling appears to involve glutamate, and excessive glutamate release may be the driving force in the remodeling of CA3 dendrites following chronic stress. This hypothesis is supported by the recent finding that chronic restraint stress induces the upregulation of glial glutamate transporter-1 (GLT-1), in an effort to reduce this stimulus, while the antidepressant tianeptine blocks this increase in glutamate release and thus protects against remodeling and limits the induction of GLT-160. Not all antidepressants share this action. It has been shown that some SSRI's fail to block dendritic atrophy following stress exposure. This could lead to the suggestion that dendritic atrophy cannot be the etiological factor which is the final step in developing a depression. However the SSRI's appear to cause a restoration of synaptic plasticity even if they do not block the effects of chronic stress. In this respect they show effects analogous to ECT61. If synaptogenesis plays a role in depression it would be interesting to see how individual protein components involved specifically in synaptic function respond to chronic stress. As parts of the synaptic release mechanism, several gene families of synaptic vesicle proteins (SVP) regulate tethering, docking, priming, triggering, and fusion of synaptic vesicles in the presynaptic terminals62,63. A set of membrane-associated proteins participate in the fusion of internal membranes by assembling the so-called SNARE-complex in the cytosol (SNARE: soluble ^-ethylmaleimide-sensitive-factor (NSF) attachment protein receptor)64. We examined the regulation of SVP by stress and found widespread effects throughout the hippocampus. In general synaptophysin was rapidly downregulated by acute stress, by about 50% while synaptotagmin was upregulated by both and acute and chronic stress, with acute stress again producing a somewhat larger effect65. These results are in good agreement with human post mortem data of Honer et al., showing abnormal SNARE-protein-expression in severe mental illness including depressed patients who committed suicide66. Since antidepressant agents are known to affect gene transcription35 for example via activation of the cyclic AMP response element binding protein (CREB)67,68, we were interested in describing transcriptional effects on SVP expression. In looking at the effects of antidepressant treatment on synaptic proteins, we found that both an SSRI, fluoxetine, and an MAO inhibitor, tranylcypromine, resulted in decreases in synaptotagmin 3 and VAMP 5 in both cerebral cortex and hippocampus, while these compounds increase the expression of synaptophysin69. This suggests that this reverses the stress-induced changes which we found earlier. All these findings and the report by Yamada and colleagues on antidepressive effects on VAMP 2 expression70 indicate that SVP are responsive to both stress and antidepressant treatments, suggesting changes in synaptic function could underlie many of the behavioral changes seen in depression. The most significant evidence of the involvement of synaptic alterations may be provided by studies on complexins (see Chapter 26). Complexins I and II, also known as synaphins, are highly conserved hydrophilic proteins and interact with the SNARE complex along the groove between the syntaxin and synaptobrevin coils71. In functional connection with synaptotagmin 1, the main Ca2+ sensor, they are crucial for late steps of Ca2+-dependent neurotransmitter release72,73. Expression studies have revealed differential localization at axospinal and axodendritic (complexin II) versus axosomatic (complexin I) synapses74, implicating a link between complexin II and excitatory neurotransmission. Complexin I knockout mice exhibit severe neurological symptoms, whereas complexin II was found to be essential for cognitive function and learning behavior75, and for the establishment of hippocampal LTP76. Post mortem studies suggested that complexin I is decreased in both schizophrenia and major depression in the prefrontal cortex77. 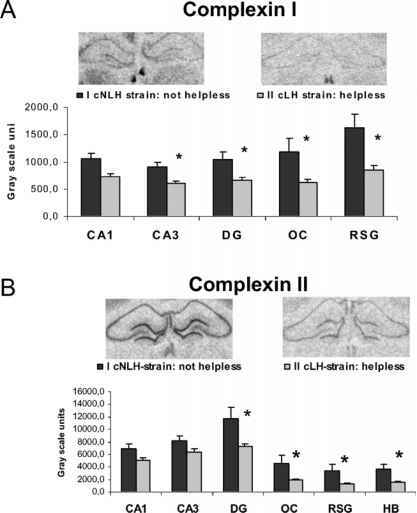 Complexin II was shown to be decreased in the anterior cingulate cortex and the hippocampus in major depression and bipolar disorder, implicating a specific vulnerability of excitatory synapses78,79. The genomic localization of complexin I (4p13.3) and complexin II (5q35.2) has been associated with the risk to develop affective disorders in several independent investigations80-82. Figure 28.1. Expression of Complexin I and II is Reduced in Helpless Rats. Cohorts of adult male rats from inbred lines with congenital helpless or nonhelpless behavior (cLH or cNLH) were analyzed. Rats from the cNLH line exhibiting not helpless behavior (n = 6, 0.83 failures in 15 trials, cumulated mean time period of current exposure: (338.6 ± 85.6 s) in contrast to helpless animal of the cLH line (n = 6, 12.3 failures, mean current exposure 700 ± 96.2 s). The cohorts did not differ with respect to age and body weight. On brain sections of the dorsal hippocampus, semiquantitative in situ hybridizations were performed with cRNA probes corresponding to complexins I (A) and II (B), synaptophysin (SPH), and synaptotagmin 1 (ST1). No significant differences were observed regarding SPH and ST1. In contrast, the helpless animals showed reduced expression of complexins I (A) and II (B). Bars show means of cohorts (n = 6) ± S.E.M in different brain regions: Hippocampal subregions CA1, CA3, dentate gyrus (DG), cortical regions such as occipital cortex (OC), retrosplenial granular cortex (RSG), and medial habenula (HB). Levels of significance (Mann-Whitney U-test, Bonferroni correction for multiple testing) are given by asterisks (*p < 0.05). This has prompted us to examine these proteins under antidepressant treatment in order to determine if these post mortem changes could be due to medication effects. Interestingly complexin I was induced only in the habenular nuclei after treatment with fluctine, while a tricyclic antidepressant (TCA), desimpramine, and an MAO inhibitor, tranylcypromine, induced only complexin II in several brain regions. This demonstrated that the post mortem effects were unlikely to be due to medication effects83. We have gone on to look at the changes in complexins in strains of animals bred for helplessness compared to animals resistant to the induction of helplessness. The former can be thought of as a genetic model of depression and we wished to see if these strains exhibited different levels of expression in the complexins. We found that both complexins I and II are decreased in hippocampus, habenula, and cortex of helpless animals (Figure 28.1) and observed an inverse correlation between mRNA abundance of complexins I and II and number of failures in the testing paradigm in several brain regions. This finding suggests that changes in synaptic proteins are associated with depression84. Are You Depressed? Heard the horror stories about anti-depressants and how they can just make things worse? 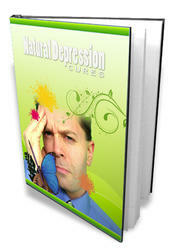 Are you sick of being over medicated, glazed over and too fat from taking too many happy pills? Do you hate the dry mouth, the mania and mood swings and sleep disturbances that can come with taking a prescribed mood elevator?